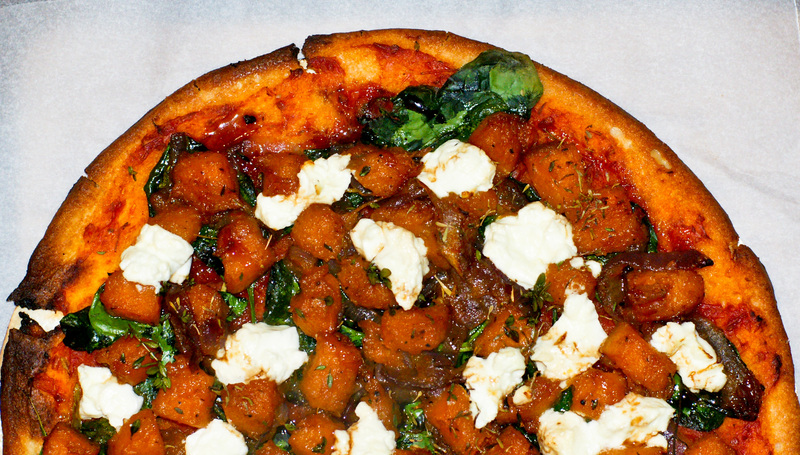 My first attempt at gluten & cow’s dairy free pizza using buffalo mozzarella didn’t go well. I read that some people with cows milk intolerance, can have buffalo milk. While it tasted amazing, it turns out buffalo’s are way too closely related to cows for me. Thankfully, I have either developed a taste for goats cheese, or I’ve managed to find a few brands that are less ‘goaty’. I’m loving goat milk brie and marinated feta at the moment. My husband loves pizza, so I have been on a search to find a way I can have it too. 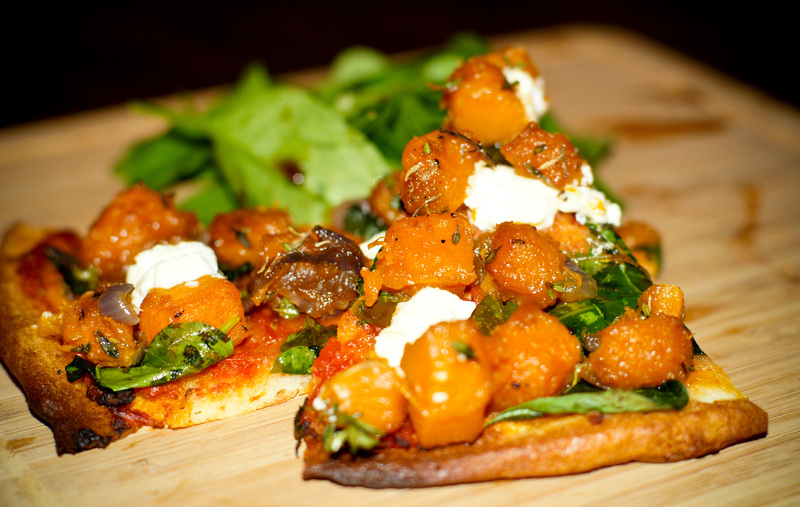 I tinkered with a few ingredients, and mixing bits of recipes I found in magazine’s and came up with this. I will definitely be making it again, it was really good. It even received a quite surprised “babe, this is awesome” from the meat-lover pizza loving husband. Heat the butter in a large frypan over low heat, add the pumpkin & onion and cook gently, stirring occasionally, until just tender. Add stock, 1/4 cup water, sugar. Bring to a simmer and cook for 5 minutes or until most of the liquid has evaporated and the pumpkin & onion has caramelised. Season with salt & pepper to taste. Spread a thin layer of tomato sauce over pizza, if using it. 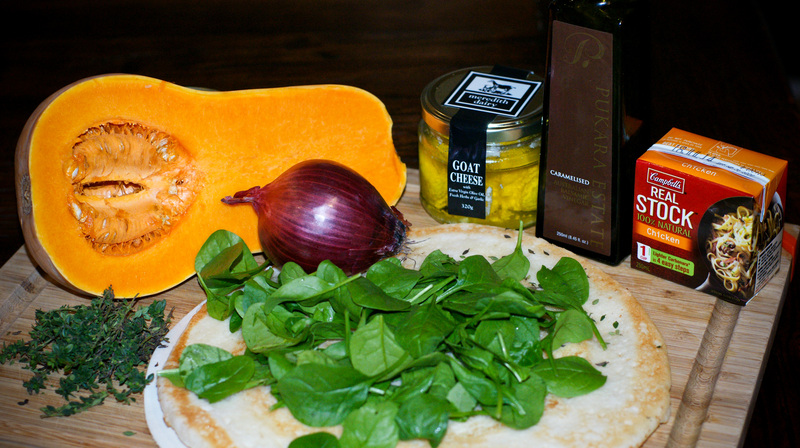 Scatter pizza bases with the baby spinach, then top with pumpkin & onion mixture, top with goats fetta and thyme, then drizzle with some of the oil from the marinated fetta. Bake for 10 minutes or until base is crisp and cheese is lightly browning. Remove from oven, and slice up the pizza. Drizzle sparingly with caramelised balsamic vinegar. I hope you enjoy this post, feel free to leave any comments or share with friends! ☺️😊 I look forward to reading more! I just got back from a little trip and am enjoying a day on the couch browsing my favourite blogs. Had to see what you have been getting up to but as you have not posted anything new for a while I just had to dive into the archives – what a great recipe this one is! !